In a particular backyard in Pittsburgh, PA, fruit began to ripen on August 16th. By the 1st of September, more than half of all fruits had been picked or fallen, it seemed. Elsewhere in Pittsburgh, few fruits were anywhere near ripe around September 1. Meanwhile, around August 14th, more than 400 miles to the south, fruit in Winston-Salem, North Carolina was also in full production. And in middle Tennessee, reports indicated that by the end of August pawpaws were just starting to trickle in. It’s suspected that a late freeze, and then a cooler season, affected blooms and pollination, and then ripening times, respectively. Fruit from a particular tree in Nashville, TN, weighed in at 15 oz. Hopes are that this fruit will make an appearance at the contest at the Ohio Pawpaw Festival. In southern Louisiana, pawpaw came on fast, in mid-July. By August 11th they were nearly gone. Good news: once again, you can order pawpaws online. Earthy Delights’ pawpaw sources are in production, and shipping now. To some extent, pawpaws remain a local thing, and take a little work. And that’s alright. Pawpaw tree, in a lot. Elkview, West Virginia. 2016. Earlier this year, in May, I got together with a friend to do some pawpaw grafting. This friend, who lives in the Allegheny Valley, northeast of Pittsburgh, was ready to say goodbye to one of his oldest pawpaw trees. Grown from the seed of fruit gathered near the C&O Canal, it just wasn’t very good. As the seedling grew to fruit-bearing age, so too did a number of the cultivars my friend had also collected and planted. Compared to these named varieties, this seedling’s fruit was too small, its flavor bland and bitter. “They look kinda like short green hot dogs, and drop from the tree without any color break whatsoever,” he said. The fruit paled in comparison, and it seemed a waste of valuable growing space. My friend had named this original seedling Charlie, after his good friend who had gathered and sent him the seed from which it grew. But now it was time for Charlie to die. Or rather, Charley didn’t actually die. Charlie became root-stock. I’ll admit it–chopping down a mature pawpaw tree was difficult to do. Not physically, but emotionally. Once I had sawed through it, though, it was time to move on. We prepared ourselves to graft. A few weeks prior, my friend attended a workshop on inlay bark grafting at Kentucky State University. The university, along with Neal Peterson, are conducting experiments with this particular grafting technique. Below is a picture I took of an inlay bark graft at KSU’s research orchard in 2016. The amount of growth shown below is from a single season, just a few month’s worth of time. Months earlier, in late winter, my friend had collected scion wood from his other pawpaw trees, and stored them in his refrigerator. The variety he chose to graft over his Charlie root stock, taken from his scion wood collection, was Susquehanna, a Peterson Pawpaws selection. Now in early September–a little over three months later–my friend says his inlay grafts are thriving (he did a few that day). The one we did together is already at five feet, and still growing. Five feet of new growth in just one, short, Pennsylvania growing season. Today is the 1st of September. And in our region, September means pawpaw. These 30 days, roughly, are pawpaw season for much of the Mid-Atlantic and Midwest. Personally, this has already been one of the most exciting pawpaw seasons to date. A few weeks ago I harvested the first pawpaw from the first tree I’d ever grown myself. I started this tree, and its companion a few feet away, from seed seven years ago. The two seedlings that are now producing have been through quite a bit. Both were started in five gallon buckets before I had any land on which to plant them. They had been variously snapped in half (and eaten!) by groundhogs, crushed by a mulberry limb (chopped down by yours truly), and lost all their flowers to late frosts. And the soil I began with was not ideal. And yet they thrive, and give fruit. The fruit ripened quite early for Pittsburgh–on August 16th. I’d begun to gently squeeze the pawpaws a few days earlier, to test for ripeness. I thought I was being impatient; they shouldn’t have been ripe yet. But a single cluster of two fruits did in fact give to the pressure of my fingertips. I wanted to let it ripen on the tree, not my counter top, so I waited. Perhaps a little too long though, because one morning I looked for the fruit only to find a void where the pawpaws had been, the peduncle now freed of the fruit’s weight. Perhaps it’s fitting though that the first pawpaws I grew and ate would have fallen from the tree. Like the song instructs: pickin’ up pawpaws. The largest of the two weighed 5.1 oz, and the smaller weighed just 3 ounces. Pawpaws in the gardens of central North Carolina are nearly finished. They may linger elsewhere in the state, and in wild places. Back in the swamps. Pawpaws in central Kentucky orchards are in full swing. Wild pawpaws are ripening and falling. (And it’s a good year too–fine eating in the orchards and the woods). Wild pawpaws in Clifton, Virginia–the report is to come. Pawpaws in the gardens and orchards of southern Indiana are ripe. A pawpaw was picked from near The Hermitage, Andrew Jackson’s historic home east of Nashville, Tennessee. It was delicious, and stood out. I recall dark orange flesh. In Chattanooga, Tennessee, pawpaws are ripe near rivers, and falling on heads. In southern Ohio, many flowers were hit by the late frost. This is true elsewhere, including southwest Pennsylvania, Maryland, and throughout the Mid-Atlantic. In Michigan, however, after a few poor years, growers seem poised for a good crop–an advantage this year for northern growers. Still, pawpaws are ripening now in southern Ohio. And a few pawpaws in the Pittsburgh area are beginning to fall. Expat dispatch: A pawpaw falls in Utah. (KSU-Atwood was the first to fall this year in that particular garden). 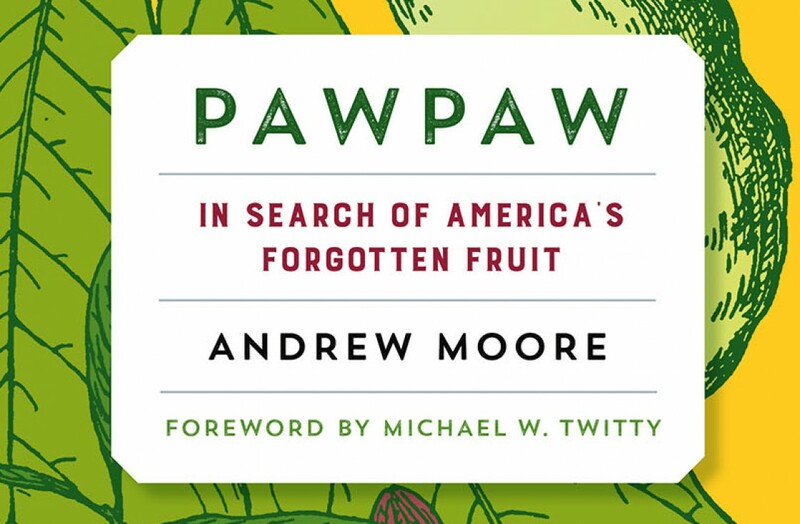 Pawpaws in the deepest South are all but finished. Pawpaws in Winston-Salem are peaking, if not waning. If you read this today or tomorrow, drive swiftly but safely to Winston-Salem–Saturday is the North Carolina Pawpaw Festival! A pawpaw cultivar feast was had in Asheville, North Carolina. Casey Trees, in Washington D.C., has at least one ripe pawpaw. A Virginian told me they got their first pawpaw this week. Pawpaws in Big Stone Gap, Virginia, are not yet ripe. In Pittsburgh, we’re still maybe a week away. Most of the pawpaws are solid as rock. If you’re north of Pittsburgh, your pawpaws shouldn’t be ripe. If you they are, that’s special, so give me a call.